Ald. Melissa Wynne attends a city meeting. Wynne said at a Saturday council meeting the city should show full support for Evanston Cradle to Career. 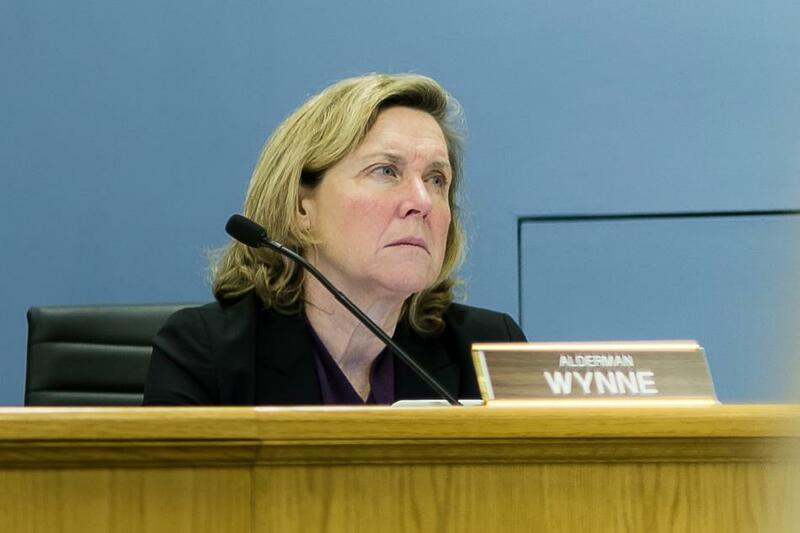 Alderman voted Saturday to direct staff to allocate more money in the proposed budget to Evanston Cradle to Career, a collective of schools, businesses and nonprofit groups that works to improve education and support for Evanston kids. The move came after multiple supporters of Cradle to Career came to Saturday’s public forum on the budget to urge the city to fund them at the same level they did in 2016. Previously, the group had received $50,000, while in this year’s budget they were allocated half of that. The group was allocated $25,000 in the 2017 proposed budget, which was half of what they received this year. The additional funding will come from the Howard-Hartrey TIF fund, which is set to close at the end of the year with over half a million dollars left over. Ald. Ann Rainey (8th) whose ward encompasses the TIF district, suggested part of the leftover funds — of which the city gets 17 percent — go to Cradle to Career. Cradle to Career is a coalition of schools, businesses and other community groups that works to help every Evanston resident become self-sufficient by age 23. Sheila Merry, the group’s executive director, said at Saturday’s meeting that although the group appreciates the city’s support, a reduction in funding would send the wrong message. Merry said it’s critical that the group has “unwavering” support from the city. “If we are going to ensure the employability of our young people and address issues of violence that exist in our community, we know that it’s going to take giving parents and young people the supports they need to be successful,” she said. Merry said the group is well situated to take additional funds from other organizations, such as the United Way, to reach their goal. Mayor Elizabeth Tisdahl said the city is doing “anything but” cutting off funding to Cradle to Career. Rainey made the motion to allocate $25,000 from the fund to the organization. The TIF will have $513,865 left when it closes on Dec. 31. Some of those funds will go to taxes and the police and fire pension funds, leaving the city with little over $87,000. Rainey said that although she is not too familiar with Cradle to Career, the organization seemed dedicated to its mission. “There was a lot of passion we heard today about this small amount of money,” she said. Assistant city manager Marty Lyons said allocating the money would have no effect on taxpayers. Ald. Melissa Wynne (3rd) said it was important to show Cradle to Career full support. The council also discussed the property tax levy and police and fire pensions at the meeting, which was called for the public to have some input on the proposed budget. The city’s police and fire pensions are currently funded at just under 50 percent. The city has been fighting an uphill battle when it comes to pension funds, like cities across Illinois. State policy and advice from actuaries has led to pensions having high unfunded liabilities. Lyons said the city would be in better shape had the pensions been more fully funded in the past. The council and city staff will continue to discuss the proposed budget in the coming weeks, with a final vote planned for late November.